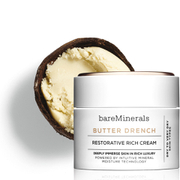 bareMinerals BUTTER DRENCH Restorative Rich Cream 50g, an intensely hydrating facial moisturiser specially formulated for dry to very dry skin types. A rich Shea Butter base envelops skin in buttery soft moisture, topping up its hydration levels for a velvety result. At the heart of the formula is bareMinerals Intuitive Mineral Moisture Technology, rich in peptides and ceramides, which works to intensely smooth rough texture and minimise the appearance of fine lines and wrinkles. Infused with the naturally derived fragrance of Bergamot and Eucalyptus which creates a moment of pleasure with every use. Skin Type: Dry Skin, Very Dry Skin. bareMinerals BUTTER DRENCH Restorative Rich Cream 50g was found on 3 websites and was price compared using EAN: 0098132445684. The cheapest bareMinerals BUTTER DRENCH Restorative Rich Cream 50g is shown as the main item, prices range from £32.00 to £32.00, excluding delivery. Price comparison based on price and delivery charges, with any valid discount codes being applied, is shown in the table above. Prices and information correct at the time of publication.